GCU Center for Worship Arts students have produced “Canyon Worship 2016,” featuring 10 contemporary songs, eight of which represent original compositions. Students from Grand Canyon University’s Center for Worship Arts will release their first full album, “Canyon Worship 2016” today on iTunes. “Canyon Worship 2016” features 10 contemporary songs, of which eight are original compositions written by Worship Arts students. They were chosen from a pool of nearly 100 song selections from GCU students. “In terms of song selection, the competition was tough. There is a lot of talent coming out of that studio,” said John Frederick, manager of the Worship Arts program, which is in its second year at GCU. “The songs are a compilation of ballads, power pop rock and some folksy alternative rock – all overtly about the Gospel. GCU freshman Graham Harper is involved in two of the original songs – a duet with Kylie Foster on the song “Beloved” and a solo performance of “Wholly Loved.” “Beloved” is a Christian worship ballad with a full instrumental arrangement, while “Wholly Loved” is more of a stripped down ballad. Other songs on the album are “With You” (performed by Katie Brown), “Peter” (Angel Morris), “Break Me Down” (Maddison Harris, Mark Harris, and David Sviontek), “What it Means to Me” (Toni Crippen), “Scarred” (John Rowe and Kaitlyn Price), and “Follow You” (Desiree Aguilar and Jessica Denae Sams), as well as two cover tracks – “Christ in Me” (featuring Harris) and “Christ be All Around Me” (featuring Tanner Krenz). “Follow You” and the cover tracks also appeared in a three-song EP released after the first year of the Worship Arts program. “Follow You” climbed as high as No. 37 on the iTunes Christian singles chart last year. Jeff Pardo, a Grammy and Dove Award nominated songwriter who lives and works in Nashville, produced six of the songs. His songs have appeared on albums by Lady Antebellum, Francesca Battistelli and Mandisa, while his production credits include Matthew West, Love and the Outcome, and Josh Wilson. Most of the “Canyon Worship” album was produced at GCU’s new state-of-the-art recording studio, where students have unlimited access to work on their music in a collaborative environment. The Center for Worship Arts is unlike many programs that are performance-based and run out of a music college. CWA combines both a ministry component and performance component and includes 32 credit hours in the College of Theology, ensuring that students are grounded in Christ and prepared to become worship leaders in churches throughout the world. It is designed to train students in all aspects of the of the music industry so they can get jobs in a world in which contemporary worship services increasingly consist of high-tech tools such as computerized lighting, video screens, electric guitars and amplifiers, wireless technology and social media. 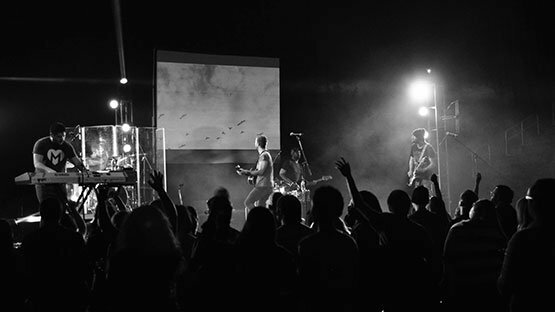 The bachelors program offers four emphases – digital media, worship production, worship management and worship ministry – and incorporates courses from the College of Theology, the Colangelo College of Business and the College of Fine Arts and Production to help students develop the skills necessary for contemporary worship and ministry. For additional information, visit gcu.edu/worshiparts. Bob Romantic at 602-639-7611 or bob.romantic@gcu.edu.